Previously we talked about creating personas and avatars to help life science marketers understand the people who buy their company’s products. Personas are descriptions of customers which help in understanding their likes, dislikes, and needs. Infographics are images which use visual elements to depict data, and by using them for personas, they provide an easy reference guide for your team to use for everything from product development to content generation. Here, we show you how to use an online tool and our template to create an infographic persona for your life science customers. We found an application called Easel.ly in beta form and were happy to learn that the company is from our hometown, San Diego. We should mention that it was evident that the tool is in its early phase as there are several glitches. The tool allows you to place their graphics or your own and resize, place, and color them. We wanted more options, such as the ability to create graphs, more fonts and more colors, but we were able to create a simple infographic which also serves as a template. We created a generic and fictitious profile for a set of customers for life science consumables products. In infographic style, we created simple icons to represent different groups, and sized them roughly according to the corresponding values listed on the left. Don’t take any of these values too seriously, they are meant only as examples. We are illustrating the fact that looking at these qualities on the whole, in the style of an infographic, will help guide your strategies and tactics. For example, if you had your heart set on putting a print Ad in C&EN but realized that your customers are 20 something biochemists, you’d rethink this tactic, as younger readers don’t normally read printed magazines. 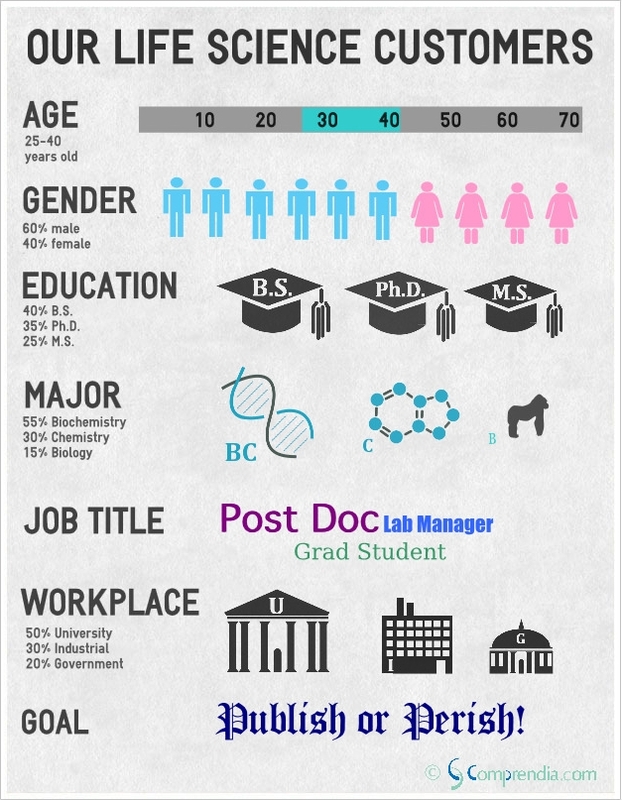 This example may be too simplistic, and we think if you create more detailed persona infographics that you’ll discover more interesting information. Also remember that you may need to create more than one infographic persona to account for different product groups and/or markets. How can these persona infographics be used? As with other marketing planning exercises, you will likely learn in the process, which always help. The completed infographic can be sent to other departments such as R&D and Sales in addition to being used in Marketing (you may want to distribute printed copies to prevent accidental distribution if the information is sensitive). The infographics will serve as a consistent reminder to everyone who the customer is and how best to reach and serve them. To create your own infographic, get an Easel.ly account and use our template. You’ll need to adjust the sizes of the icons to account for your data, and it’s not a perfect science. We suggest that if you want to get the sizing perfectly right that you make adjustments to the images before uploading. Consider also that you can make infographics using any graphics program.